The Cybersleuth's Guide to the Internet has been updated to a new 11th edition. Much of the information that was once only available to professional researchers from expensive, fee-based sources is now available for free on the Internet, if you know how to find it. There’s more to conducting a comprehensive search for information on the Internet than just relying on the results returned by search engines, though. The Cybersleuth’s Guide to the Internet will show you how to be your own cyber-detective and unearth this information FREE (or at low cost!) on the Web. The Cybersleuth’s Guide to the Internet includes numerous examples based on real world research scenarios. Whether you’re just starting to use the Internet for serious research or you’re a seasoned online research veteran, this book can help you find what you’re looking for fast and free. For the beginning searcher, the book covers many overlooked features of Web browsers, the "mechanics" of navigating the Internet, and basic research strategies and tools. For "power searchers," The Cybersleuth’s Guide to the Internet covers more advanced search strategies, and uncovers tip and tricks for getting the most out of many of the sites. Availability: The new edition of this title is currently available and usually ships within 2 business days. To inquire about discounts on larger quantity orders e-mail Research_Guide@netforlawyers.com. 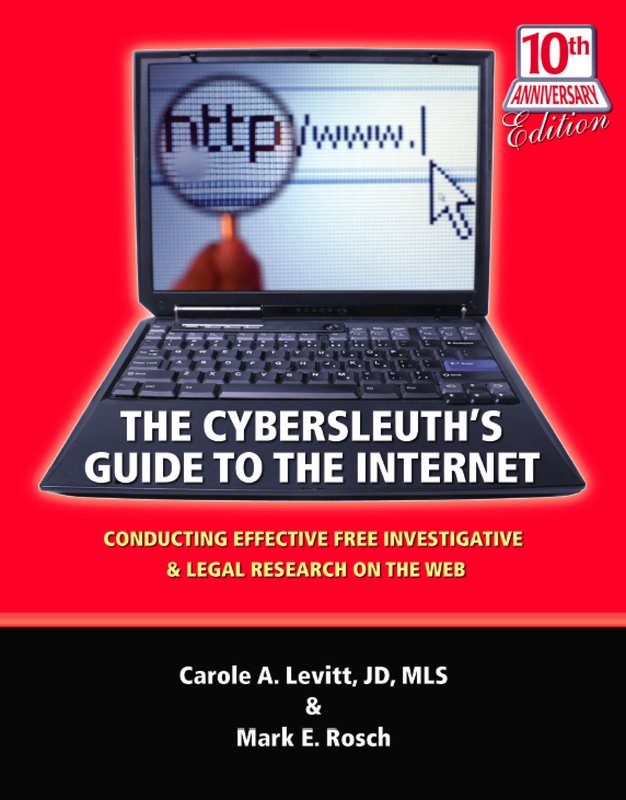 The all new expanded 10th edition of the Cybersleuth's Guide to the Internet features the best federal legal research resources, as well as comprehensive information for locating state and local resources for all 50 states. This new edition also includes detailed reviews of the newest Internet resources such as Justia.com and Social Networking sites. It also includes extensive recommendations for free public records, investigative and people finder resources available for free on the Internet, as well as low-cost pay services, such as Merlin and Accurint and free sources for case law such as Justia, PLoL, and PreCYdent. Even if you're not exactly certain what site you're looking for, finding a site you need is easier than ever with this edition's updated and expanded index. Whether you're looking by jurisdiction, type of information (e.g. real estate records), or by web site name, you will find it quickly in the guide's comprehensive index which includes more than 1500 entries. Levitt is a lawyer, law librarian and legal educator – she is not a computer technician. This guide is based on her more than 20 years in the legal field and is written the way legal professionals actually search for information. She has also been a regular contributor to the "Computer Counselor" column for the Los Angeles Lawyer magazine. Levitt is active in Bar activities at the state and national level, currently serving on the Executive Council of the American Bar Association's Law Practice Management Section and previously serving and Chair and a member of the Executive Committee of the California State Bar Law Practice Management & Technology Section. Rosch is a frequent speaker on the topics of Internet research and using technology more effectively in the practice of law. He has also written on computer-related topics for numerous publications including Law Office Computing, Law Practice, Small Firm Business, FindLaw and LLRX.com among many others, and is also a regular contributor to Los Angeles Lawyer magazine's "Computer Counselor" column. Together, Levitt & Rosch are also the authors of Google for Lawyers: Essential Search Tips and Productivity Tools (2010), Find Info Like a Pro, Volume 1: Mining the Internet's Publicly Available Resources for Investigative Research (2010), and The Lawyer's Guide to Fact Finding on the Internet (3rd Ed. ; 2006) - all published by the American Bar Association, and have recently conducted hundreds of in-person MCLE programs for numerous Bar associations, law firms, corporations and other professional organizations. Thousands of copies of the books nine previous editions are helping legal professionals all over the country save time and money as they conduct legal and investigative research. This guide has also been added to numerous county, academic and corporate libraries. Add this book to your collection and put the authors' years of research and training experience to work for you.